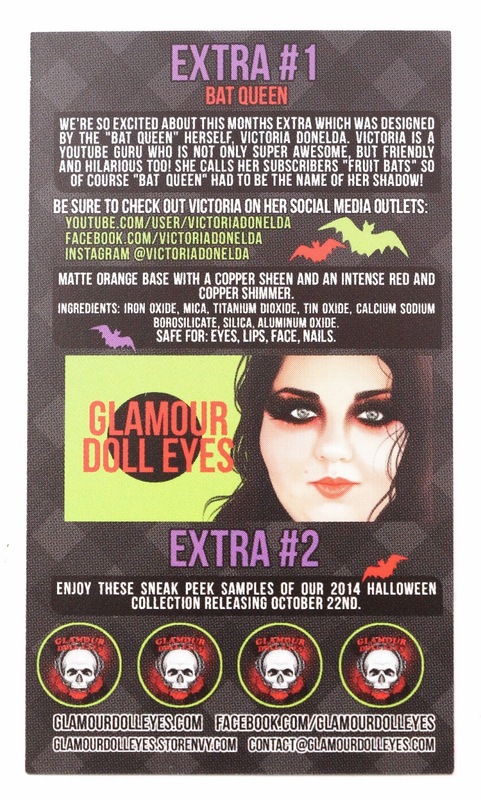 My October Glamour Doll Eyes OTM arrived! I had no idea how I was going to get into a slot for this subscription as it's highly competitive, there are limited spots available, and even getting a 3 month was going to be difficult. But Vanessa, from Glamour Doll Eyes was generous enough to host a "giveaway" of sorts, where she needed a few people to test her new subscription software that is going to be used for 2015. I won, and I still paid for this, but I was guaranteed a slot. Phew! It took off all the pressure, I am so grateful. And it now means that I will be getting this sub for the foreseeable future! The OTM is shipped out at the beginning of the month, for me it was on the 8th, the same day I paid. It's shipped via USPS and arrived 2 days later from Nevada to California. Here is the very festive info card for October! I love the Halloween/bat theme this month! Mausoleum - "Medium gray with a red and orange duochrome & purple and blue sparkle." 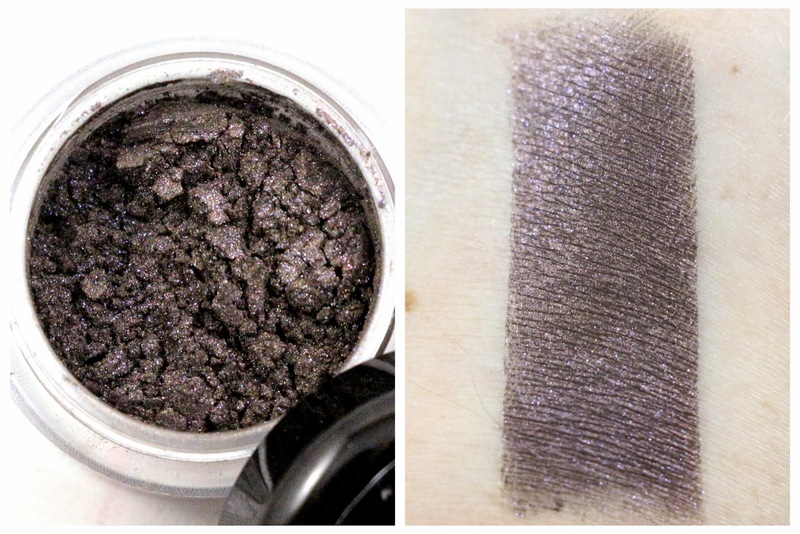 I really like this shade, it's like a blackish grey with a purple duochrome. You can definitely see the purple and blue sparkles, and I am just so glad this was in the OTM this month, it's unique to my stash! 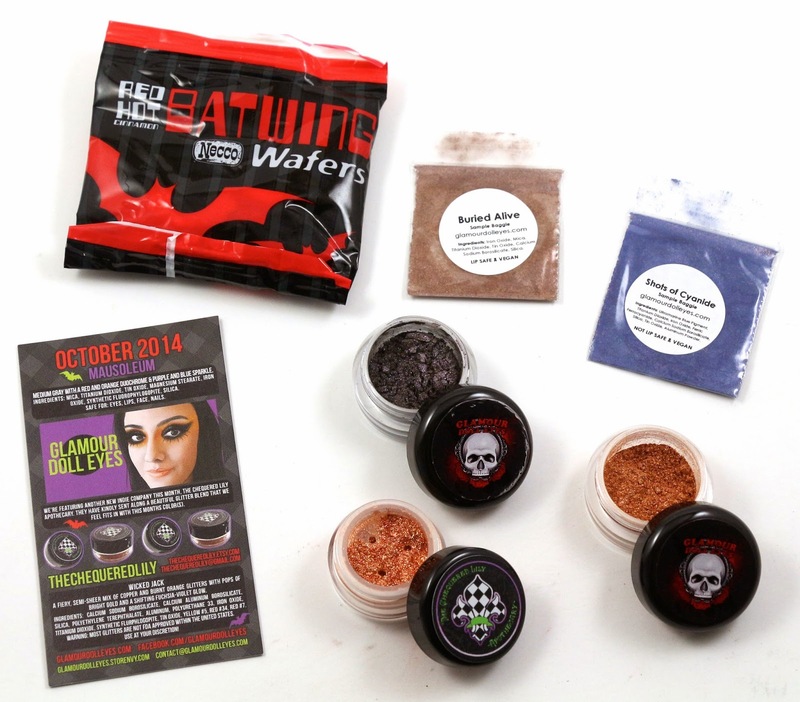 It's going to be perfect for Halloween, and even better paired with the other shades I received! 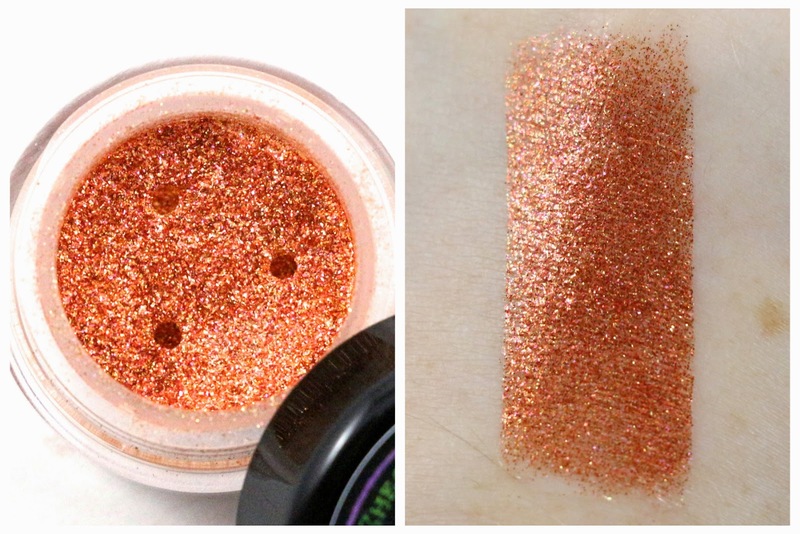 Bat Queen - "Matte orange base with a copper sheen and an intense red and copper shimmer." Ok, so a little backstory about when I heard the name of this shadow...I told B I was going to be a Bat Queen for Halloween and wear this shadow and a bat crown. It goes back even farther when we lived together during our senior year of college, when I had found a paper crown in some stuff we had and I put it on and wore it until he got home. He still thinks that's one of the funniest moments, coming home and seeing me on the couch with a crown on my head. Anywho, I love this shade and I'm going to pair it with Mausoleum. I for some reason or another have a lot of orange shades in my collection, but the copper sheen and red shimmer set this one apart. It's a perfect pumpkin orange color. 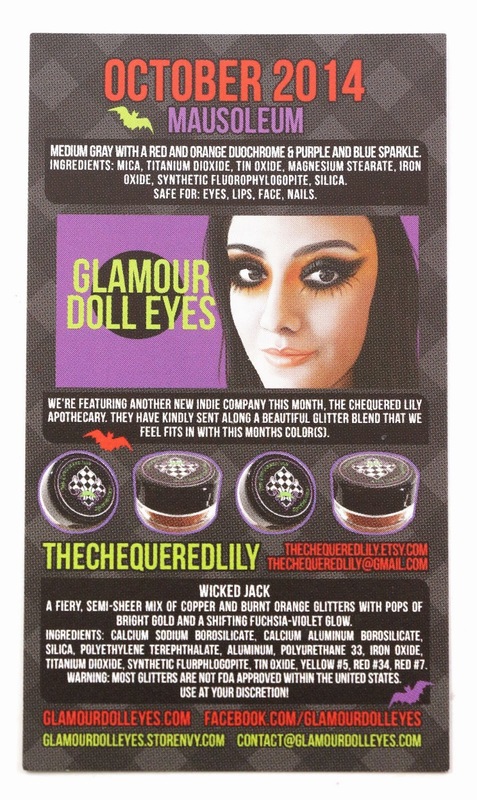 The Chequered Lily Wicked Jack - "A fiery, semi-sheer mix of copper and burnt orange glitters with pops of bright gold and a shifting fuchsia-violet glow." The Chequered Lily is an indie company based out of San Diego (whooo San Diego!) that I have never heard of, but this glitter looks like it was specially created for the OTM as I don't see it on their Etsy shop. Now I am not keen on glitter, but I think this will look great over Bat Queen, and I think Halloween calls for a little glitter. The description is spot on, it's definitely semi sheer, so you can pack it on, or use it sparingly for a hint of sparkle. It's a pretty fine glitter which I can appreciate, so that from far away it could be mistaken for just a glittery eyeshadow, instead of straight-up glitter. Hopefully with the Glitter Fix we got last month I can master a look with this, Bat Queen and Mausoleum for Halloween! Here's my look using the shadows and glitter from this month! I used Too Faced Shadow Insurance primer, Bat Queen on the inner two thirds, Mausoleum in the crease, then Glamour Doll Eyes Glitter Fix over Bat Queen, and Wicked Jack glitter over that. Brow highlight is Glamour Doll Eyes Electric Chair, and the lid eyeliner is Sugar Skull Minerals Sushi used wet. And I did my brows! Aren't you proud of me? 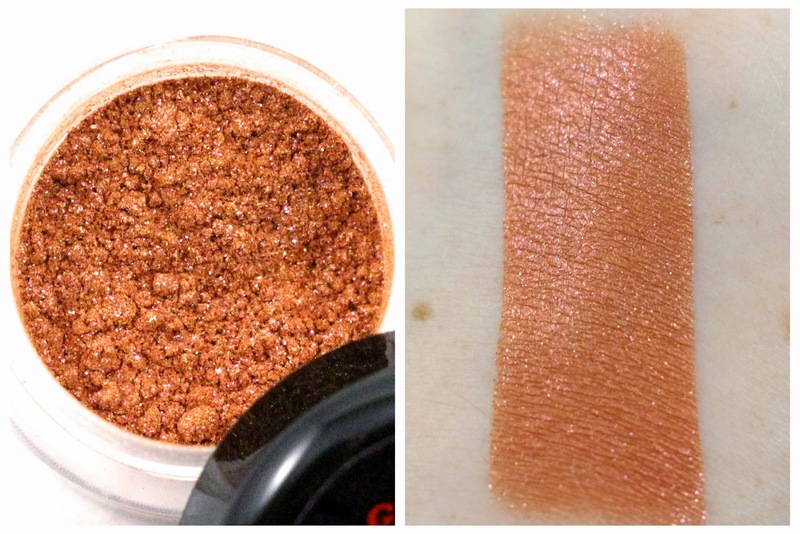 Buried Alive - "A medium shimmery brown with an orange overlay and red & holographic sparkle." Ooooh I love the spooky dirt color this has! As of this review, I have already purchased this collection, so I will eventually have a whole review of all of the shades. 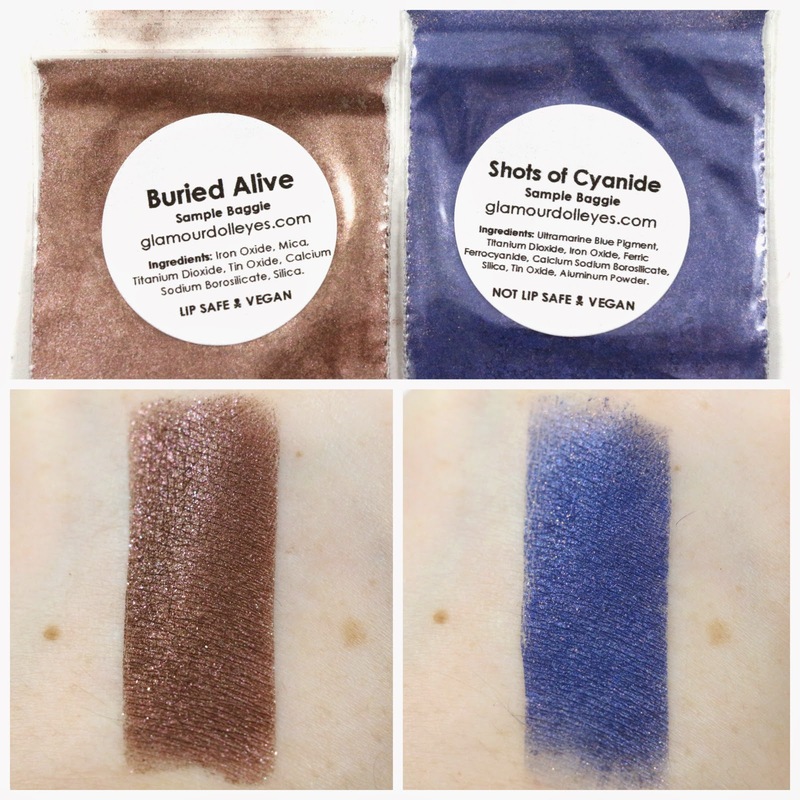 Shots of Cyanide - "A midnight blue with a blue and reddish sheen, copper sparkle and a greenish/golden shimmer." I really like this shade, it's like a dark denim blue, and same with this shade I have ordered the full size, so a full review with this and the other colors in the collection coming soon. Overall, I really loved this month's Glamour Doll Eyes OTM, I seriously ate those candy Bat Wings so fast while taking these photos! They were so good, like red hot Necco bats, om nom nom! 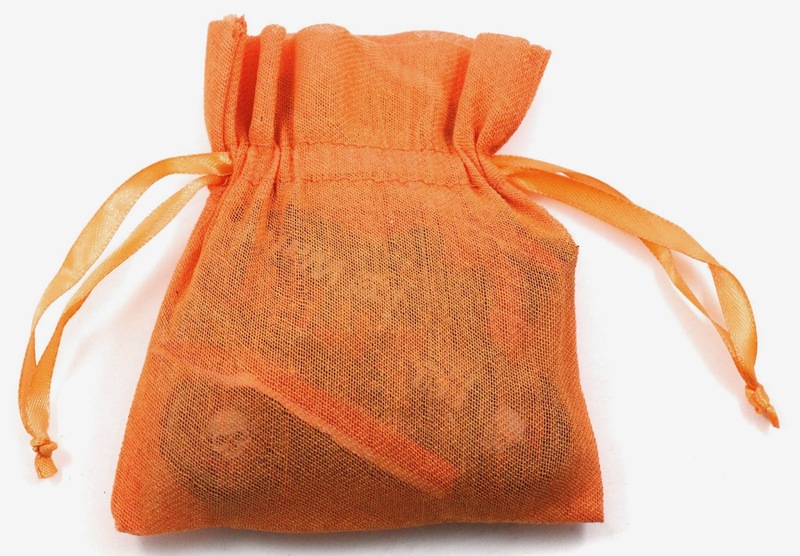 I'm going to hunt those down and buy a couple big bags. But back to the actual shadows, I really thought this month was a great cohesive theme, and all the shadows and the glitter will work great together for a Halloween look. And I always love getting sneak peeks at coming collections, even if I already know I'm going to be buying it! The Glamour Doll Eyes OTM is a limited subscription you have to act fast if you want in! Every month on the 8th (or the Friday before if the 8th falls on a weekend) they offer up the subscriptions to sign up for. The price will depend on which subscription you sign up for, but you will always get more than what you paid.